Written by Carl Lamson Carmer (1893-1976), who grew up in upstate New York. In it, Carmer relates his six years of discovering the people and culture of Alabama in the 1920s. More than 70 years after its publication, students, scholars, and the general public still read the book and enjoy the stories that Carmer heard during his years in Alabama. Mike Keahey of Fowl River recovered the book and loaned to us for copying to our Archives. 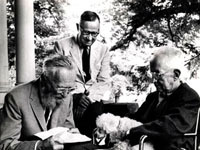 Carl Carmer (center), author of Stars Fell On Alabama, visits with renowned photographers Edward Steichen (left) and Charles Sheeler (right) at his home in New York State in 1963. For six years Carmer traveled to every corner of the state, kept copious notes, and later turned them into Stars Fell On Alabama, referring to an 1833 meteor event that appeared as a shower of stars falling on the countryside. Published by Farrar and Rinehart in 1934 and illustrated by LeRoy Baldridge, the story was so unusual that it defied conventional literary definition. It was part memoir, part history, and part cultural analysis. Today it would likely fall into the category of creative non-fiction, similar to Truman Capote's In Cold Blood.